This is (nearly) the moment we’ve all been waiting for! Cobalt is so close to updating, we thought we’d give you all a little message to let you know how, when, and what is going to happen. So let’s get stuck in! Starting off with the Skyblock realm. We have redesigned our Skyblock plugin from the ground up to allow for easier island visits between friends, owning multiple islands (including nether, end, and a secret type), island levels, island expansions, and more. We've got a new spawn built by Ruslana with a revised shopping system to make Skyblock a bit more interesting. The sport of chicken racing requires three things: a chicken, a saddle, and Elite+. If you do not have any of these things, we provide chicken and saddles. If you do not have Elite+ you may still participate by placing a bid and on the bid you may earn up to 20% of the bet earnings from that days race. Chicken racing, you may not have heard about it, you probably haven't! Chicken Racing is a new sport created by myself, where an Elite/Premium gets on a chicken and races to see who wins, the race's winner will receive all of the entry fee's and 50% of the bid money. The winner of the bid money is decided through a drawing. Any chicken racer who goes over a fence at any point in the race is disqualified. You must start at the same time, going early will get you disqualified. If you start late that's your fault, if you get turned around it's your fault, we aren't restarting because you started late or went the wrong way. It may or may not be Christmas yet for you, but either way... Merry Christmas! If you say the phrase "Merry Christmas" in chat for the next 48 hours, you will be rewarded with 50 gems. But that's not all! If 200 players all say "Merry Christmas" in chat, there will be a special prize to those of you who said it. If we reach this goal, the prizes will be given after 2017! We are very excited to announce our annual Cobalt Christmas Celebration! The celebration will include an entire month of present hunting and even a special gift on Christmas! Thanks to Ruslana, we've got a brand new map: Santa's Kingdom! Our Present Hunt is back for a third year and better then ever! We have hidden 20 presents (chests), which require some challenges, parkour, and searching skills to find. Once you complete the hunt you will be given a code to use in Survival or Skyblock only. That code will give you an epic prize exclusive to this event, and additionally, 100 gems. The Present Hunt will run on the Hub from Dec. 10th - January 9th and can be accessed by using the portal in the Hub spawn area or the command /hunt. There is a new build contest for all you Cobalteers*…The Monthly Hub Build Contest. Unlike the majority of the other build contests on Cobalt, this one takes place in Survival! Yes, that’s right, Survival. That means you have to mine (or buy) the materials you need to build your entry!… AND, this is a monthly contest; so a new one will be run every month! What this contest entails is simple: build a statue! … so if you feel you aren’t good at big, elaborate builds, no problem! These builds are small (9x9 blocks maximum, and 13 blocks high) and should take you no time at all! So building contests are cool right, but not everyone feels like they can join in. So let's do something else too! How about a spooky halloween skin contest?? For this contest, you need to show us your best halloween skin! Make sure you take a screenshot in a spooky setting, and we'll see who has the best skin! 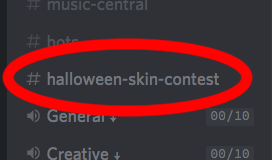 Take a screenshot of yourself on Cobalt, and post it on our discord server in the Halloween skin contest channel! 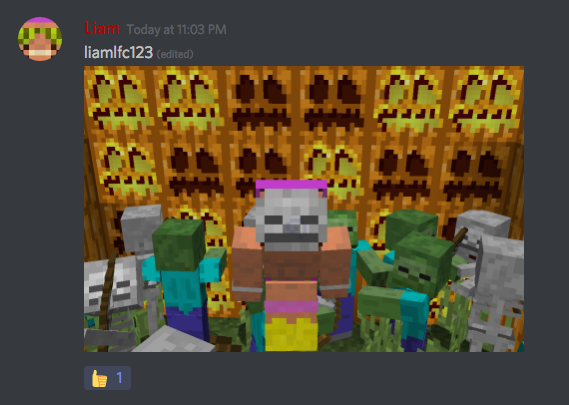 Please add a caption to your post stating your minecraft username if it isn't obvious (which it should be) from your discord username. Our handy bot "Halloween Helper" will add a thumbs up reaction (pictured above). To vote for a skin you like, just click the reaction and your vote will be tallied. Contest Ended Haunted House Building Contest! We are back with another Haunted House building contest! And once again the winner will have their house showcased in the hub for a week either side of Halloween! That's right, the winner! Only one person will win this contest, so you will have to try your best! Your building must be Halloween themed. Decorations inside and outside are vital! However with the house going into the hub, landscaping will not be judged. Please build on a flat square of 31x31. You can build the house on any plot you have access to, as long as you personally built it. You have no block limits. Since this house will be going into the Hub, you can use all the expensive blocks previously disallowed. Contest Winners Treehouse building WINNERS!! There was some good entries to this one, I suggest you all get to creative and check out the entries! Look out for another building contest soon too, with Halloween just around the corner. Now onto the winners! Cobalt moderator Grisoustyle has made us this snazzy looking video to show off the winners of the 4 categories, but if for some reason you don't want to watch it, here they are anyway! Congratulations to those 3, who have all won $50,000 on survival or skyblock and 400 gems for each category won! GalaxyKT has also won the opportunity to have her treehouse moved into the survival realm! Every approved entry has also won 50 gems!